When the young and optimistic Sidney Webster left Gilmanton, New Hampshire to attend Yale University, he could have had no idea of the remarkable career that was ahead of him. Webster was graduated in 1848 and from Harvard Law School two years later. The young attorney’s “capacity for statesmanship and the management of men,” as later noted by The New York Times, caught the attention of newly-elected President Franklin Pierce. The President took the 24-year old to Washington with him to serve as his private secretary. Throughout the Pierce Administration Webster became closely acquainted with the nation’s leaders, among them United States Senator Hamilton Fish of New York. With the end of Pierce’s term of office in 1857, Webster returned to New York and on June 7, 1860 married Sarah Morris Fish, the eldest daughter of Hamilton Fish. The couple moved into a wide rowhouse at No. 245 East 17th Street in the fashionable Stuyvesant Square neighborhood. While Sidney Webster practiced law in New York, his father-in-law was appointed to President Grant’s Cabinet as Secretary of State in 1869. He routinely consulted Webster on matters of constitutional law—an area in which Webster was regarded as an authority. By 1883 Sidney Webster had accumulated a substantial fortune. That year Stuyvesant Fish, Webster’s brother-in-law, persuaded him to become a Director of the Illinois Central Railroad. At the same time Edward H. Harriman also joined the railroad as director. Not only did the two strike up an intimate friendship that would last for decades, but Harriman relied on Webster’s deep experience in public life, his astute judgment and his detailed understanding of the law in many of his most critical business decisions. In the meantime, the house in which the Websters lived had become decidedly passé. Esteemed architect Richard Morris Hunt was commissioned to design a new residence for the site. The same year that Webster entered the Illinois Central Railroad the new house was completed. Hunt produced an asymmetrical, modified French Renaissance home like nothing in the neighborhood—or in the city. The high brownstone first floor created a base for the three stories of orange brick above. Ornamentation was reserved, for the most part, for the top-most floor above a brownstone cornice where four joined dormers framed the steep roof behind. In keeping with their wealth and social status, the Websters were expected to maintain a country retreat. In April 1899 the attorney purchased the George F. Jones estate in Newport, Pen Craig and Pen Craig Cottage. The Times reported on the purchase. “There is a handsome villa on it, as well as greenhouses, a gardener’s cottage, and a landing pier. Pen Craig Cottage, situated on the other side of Harrison Avenue, together with the adjoining lot [is] also included in Mr. Webster’s purchase." All the while Webster divided his free time among his various gentlemen’s clubs: the Knickerbocker, the Manhattan, Metropolitan and the exclusive Union Clubs. All the while that Webster practiced law and kept his affairs above board, his close friend Edward Harriman was deeply involved in the back rooms of politics. In 1904 Theodore Roosevelt approached him, asking him to raise $200,000 for the New York State campaign. In exchange Roosevelt promised to remove Chauncey M. Depew from the Senate and send him off to Paris as U.S. Ambassador. Harriman raised the money, the Republicans won the election and the President backed away from his promise. Harriman was surprised and outraged. In January 1906 he wrote a lengthy letter to Sidney Webster, addressed to his home on East 17th Street. In it he detailed the agreement with the President and how he had been double-crossed. In a mysterious manner never quite explained, the letter was leaked to The New York World, which published it in April 1907. The letter, which became popularly known as the “Where do I stand?” letter, caused a political scandal. Roosevelt’s response was denial. “Mr. Harriman was duly branded as a liar by the President,” said The New York Times. Through it all Webster remained unscathed; his sterling reputation untarnished. On May 30, 1910, Webster died at Pen Craig in Newport. Sarah remained in the house thirteen more years. Then, on February 16, 1923, she died in her “cottage” in Newport, as her husband had. Two months later the Websters’ only son, Hamilton Fish Webster, sold the family home. Charles Tatham purchased the house. A partner in Tatham and Brothers, makers of lead shot and tin-lined iron pipe, he was an accomplished fencer and for years was treasurer of the Fencers’ Club of New York. The family was still living here in 1932 when the engagement of daughter Anne Sands Tatham to Lawrence Jacob Abbot was announced. The marriage would bring together two literary families—Anne’s grandfather was Edward Payson Roe, a well-known novelist and author of “Barriers Burned Away;” while Abbot’s parents were both editors and writers. Following the Tathams, No. 245 became home to Dr. Benjamin Stich and his wife Mollie. Stich was a diagnostician with the New York Post-Graduate Hospital. On August 11, 1942, on his 50th birthday, Dr. Stich suffered a heart attack in the house and died. In the early 1960s pianist Hazel Scott lived here following her divorce from Democratic Representative Adam Clayton Powell, Jr. She was publicly embarrassed in 1962 when an income-tax lien was filed against her for $44,198.18 in unpaid Federal income taxes. Then, through the 1980s and 1990s the house was used by the Beth Israel Medical Center as a psychiatric clinic. In 1995 it also housed the hospital’s Nutrition Center. Here participants were educated in, among other things, which foods caused weight gain, how to read food labels, how to modify recipes and how to make sensible food selections in restaurants. Sadly, the clinical use decimated the interiors. By 2004 when the home was taken over by the East End Temple, little was left to salvage. BKSK Architects was commissioned to renovate the house into a synagogue and the interiors were essentially gutted. 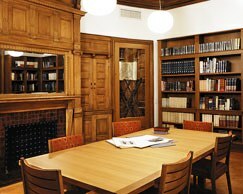 Although most of the architectural detailing is gone, replaced by sleek modern designs, the library retains its 1883 oak mantle and paneling. And outside, Hunt’s dramatic French Renaissance design survives.